This is a “lighted” wall overlay that’s visible from the neighborhood. Lovely at night for giving your playable lots the illusion of being lighted. Not as lovely during the day. Comes with a warm and white light. All overlays can be removed from your game completely by deleting the package from your downloads folder. PLACEMENT & USE: With the walls up (roof off) attach the overlay to the top of the grid in front of any windows or doors you’d like to appear lit. The overlays are hidden in live mode. Use the hammer to delete. The L key toggles between day and night. ISSUES: The lot imposter doesn’t always appear lit in the neighborhood view. Entering an unoccupied lot that has all of the same light colors (or placing them if no lot exists) and saving seems to be the most reliable way to update the lot imposters and “turn the lights on” but you have no control over how the light effect will display. I recommend you watch the how to video if you're downloading these. 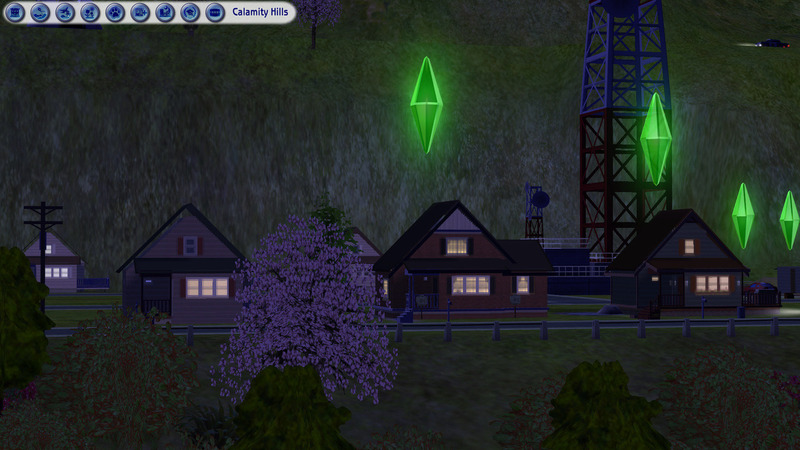 I add lights to Calamity Hills and highlight any issues as I encounter them. Roux and Maxon (here and in youtube comments) theorized that for these to work on apartment lots they have to be applied to the base lot when it's being built. iCad shared some pics and playtest notes on tumblr and confirmed that. Jo has confirmed these do not work with the HoodLODBuild set to improve Maxis windows in hood view by Klaarti and Leefish. SimPE, Milkshape, and Photoshop. iCad for the inspiration, netmicro for the enter/exit bhav and MTS for hosting. Yasss Honeywell! When I saw you were talking about trying to create these, I didn't think it would come around so quickly! Wow, this is ingenious! This looks amazing in neighbourhood view. You usually force a Lot Imposter update by making a build mode change (delete and replace a wall/floor/window whatever), but with apartment lots, you a. can't (easily) make a build mode change and b. aren't actually changing the lot when you do make a change IF THE APARTMENT IS OCCUPIED. That's because of the way apartment lots work. When you build one, you build a lot as you normally do. But when you move someone in, the game makes a copy of that base lot and moves the sims into that. The base lot is unchanged by the move in. So if you try to change the building of an occupied apartment lot, the base lot is not changed. This is to allow you to move sims out and move in new sims and for the lot to revert to its original state. I'm guessing that's the issue - the overlay occupied lot is changed, the base lot isn't. Hence it's not lighting up in neighbourhood because no change has happened on the base lot to force the updating of the lot imposter which is what the game uses (the base lot) to display in neighbourhood view. I know it's an issue because I too had a similar problem with the little defaults I made to force the game to display the original flowers in neighbourhood view (here, if you're interested). (both are true or false as they're boolprop cheats). I'm guessing the first cheat though you'd have to experiment. Though, tbf, it might not work at all. I'm pretty sure the first method would work though. What we could do with, as a game tool, is something that forces the game to update the lot imposter. Oh that Mootilda were still with us. Very Impressive! And amazing to see in hood view at night. Curious thing about apartments. I wonder if they have a different lot imposter or callls to the lot imposter?! I am very curious about why apartments work differently. I may go on a testing spree later on in the week! Thanks for working on these! It never ceases to amaze me what ideas you creators come up with! I was just thinking how nice it would be if some windows on the street could be lighted and you did it! Personally I liked the white lights quite a lot too, but I agree with you on the other colors. Definitely trying the original lights in my neighborhood. Thanks! AMAZING! This is seriously genius. Thank you so much! Thank You Honeywell, this is Amazing! These really DO add that 'little something' that was 'missing' for so long. Little 'details' really DO make a difference. I really don't think these look 'bad' during the Daytime. It just looks to me like Someone Left the Lights ON! Also, I think the Recolors would be great applied to a Nightclub or similar; considering all the colors of a Dance Floor, it would make sense to be able to view various colors emanating from the windows of such a place. The Blue Lights looked to me like someone was watching television in a darkened room at night. In any case, I ♥ this idea/creation; Thanks Again for creating/sharing! Really enjoyed the youtube video and left a comment there too. I have some neighborhoods where they will work perfectly. Thank you! If only there was a way to sync up these with the hood night time, that way it wouldn't look like sims are spending exorbitant amounts on power. regardless these are nice and a cool creation. You never cease to amaze me Thank you. I ran a test with the HoodLODBuild set to improve Maxis windows in hood view with your window light film and it does clash. I tried directly behind and 1/4 tile placement behind. If a custom window is used it gets around the issue. I've always wanted something like this for the game, now I finally have it! Even the custom wasn't showing well when I reloaded the game today. I guess it's one or the other. #18 7th Mar 2019 at 1:57 PM Last edited by Honeywell : 8th Mar 2019 at 8:36 PM. Thanks for the comments guys. They're what makes sharing worthwhile and I appreciate each and every one. I updated the main thread with playtest notes -- if you have something to add from trying these post somewhere I'll see it and I'll be sure to update the list. If you share pics on tumblr and I don't see them let me know and I'll reblog them. Jo, these are both object mods so while you can't use this overlay with Klaarti and Lee's modded window LODs, having those in doesn't change the way the light works in your other windows. What you're experiencing is the "you have no control over how the light effect will display" part of my issues statement. Entering and saving an unoccupied lot that has the window lights is the most reliable way I've found to turn these on - or back on if they go out - but it's a matter of trial and error I'm afraid. On the plus side, it does not appear random so what worked once seems to always work. A PITA - trust me I know - but it is what it is and the best I was able to come up with. Actually, after playing with it for longer I realize it comes and goes. I only have a couple of houses with them and sometimes neither house is lit, or both or one and the lighting is more subdued usually when they do show. It seems really random as to how they will show. It could indeed be the whole "I have my own mind and you can't do a thing about it" But it does show a little on the LOD's when placed back 1/4 tile, sometimes. But that's okay, real people do have their lights on in various ways and at different times. It's funny you said that. As I was playing I gave up trying to go back to that one house I know will make them "turn on" if I enter and save and just said eff it - the lights are out, no ones home in that house. I really wish they were reliable and even reached out to a few people to pick their brains to see if there was anything I could do but nothing came of it, more's the pity. In using these more, I haven't run across any problems with getting them to light, aside from the apartment issue. Unoccupied dorms worked fine, though I don't know if there might be issues with already-occupied dorms, since they're sort of similar to apartments. It does seem as if there has to be one unoccupied residential lot lit to get any of the occupied lights to light, and I have no idea what that would be, but it seems consistent. It must have something to do with whatever triggers the lot imposters to update. Even with the small-detail issues, I continue to be desperately in love with these. Thank you, again, so much, Honeywell! Commenting again because I'm thinking it might be better to keep the topics separate! I played in my game a little bit, lighting up a custom uni template I'm working on which, because it's a template has absolutely no Sims and therefore no occupied lots. It does have community lots, two dorms and two apartment buildings, no single-family residential lots. I lit up a couple of community lots and one of the dorms and nothing lit in hood view. Then I lit one of the unoccupied apartment "base" lots...and everything lit up in hood view. So, apparently an unoccupied apartment "base" lot will push the whole neighborhood to light, like a normal unoccupied residential lot will, whereas an unoccupied dorm will not. I guess I'm just trying to piece together what it is that makes these neighborhood-visible or not, so...yeah. Very happy to hear you're still using these since you're the reason I made them. The chances of anything showing from neighborhood view on an OMSP is slim to none I'd think based on my understanding (I could be wrong I haven't tried it) so I'm doubtful. That and hanging from the top of the grid is part of why they work -- you couldn't replicate the lot imposter glow with say a painting I don't think. But there's no reason why a custom mesh that fits the greenhouse roof cloned from these shouldn't work. Take the greenhouse roof glass mesh and position it to hang at the right height and that would probably be all there is to it. I really need to play my own game for the next little while to catch up on my let's play but if what I described isn't something you can do (or someone else could help with) if you link me to the greenhouse you use I'll give it a try when I can and see if it works. Re: Your last post. Please do keep the playtest comments coming! I can't even pretend that I have these figured out yet but the more experiences that get shared the better. Yeah, I kinda figured something like that. With as weird as the game is about updating lot imposters, best not to upset the apple cart, as they say. I'm pretty sure I don't have the skills to make something for greenhouse roofs, myself, as I have a bad track record when it comes to meshes because I really have no idea what I'm doing. But on the other hand, I do not wish to put work onto you; you were generous enough to spend a weekend making these, and I appreciate it very much! But if you ever wanted to take a look at it, I only ever use the plain Maxis greenhouse roof when I use one at all, and I think each tile of that is the same "height" as a wall tile, just inclined to 45 degrees. I think, anyway. It's hard to tell just by eyeballing it. But please, don't feel pressured to look at it; I can certainly live with unlit glass roofs, since I use them seldomly, anyway.